Each box of ISAV Rapid Kits contains 10 kits. The kit is a rapid chromatographic immunoassay for the qualitative detection of Infectious Salmon Anaemia Virus (ISAV) in fish kidney. The lateral flow kit has both a control line and a test line that are not visible before conducting the test. The control line is a procedural control and a purple line will always appear there if the test is carried out properly. A purple line will be visible in the test line when the sample added contains ISAV. This is a positive result. The ISAV antibodies used in the test line enable the kit to detect ISAV antigen in fish kidney with a high degree of accuracy. 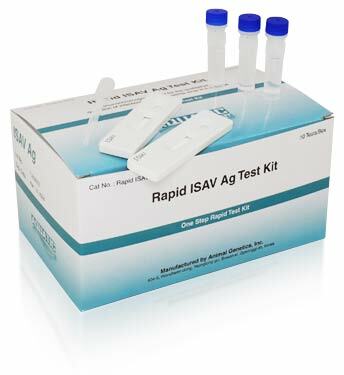 Infectious Salmon Anaemia virus (ISAV) Rapid Kit (0,75 MB).